Film Movement’s latest offering is a mouthful: Munyurangabo. It’s the first film shot in the Kinyarwanda language, which is spoken by the people of Rwanda. Though it’s not directly about the ethnic strife between Hutus and Tutsis, the characters are shaped by the genocide and lingering ethnic hatreds. 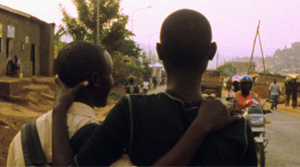 Two young friends leave the big city of Kigali on a mission. They are hitchhiking and walking because one of them spent their bus money on a new shirt; he wants to visit his parents for a day before they head to their destination. Sangwa (Ndorunkundiye Eric) returns home for the first time in years since he left for the city. Father shames and scolds him for taking so long to return, but otherwise his parents welcome him back. “One more day,” they ask him repeatedly, each day assigning him one more chore that needs doing. But Sangwa’s friend Ngabo (Rutagengua Joseph “Jeff”) is eager to move on, a feeling strengthened by Sangwa’s parents’ dislike, and by Ngabo’s own jealousy of Sangwa’s intact, happy nuclear family. Ngabo’s father was killed in the genocide and it eats him to this day. The movie lingers in Sangwa’s village, getting more comfortable when we focus on Sangwa, and more antsy when we focus on Ngabo. The penultimate scene is a very long recitation by a poet encountered at a little storefront. Liberation, he says, is a journey. The poem, a tripping trochaic quadrameter, is wonderful to listen to for its rhythm even if you don’t speak Kinyarwanda. (The DVD extras tell you that the poet is playing himself — he’s a poet laureate of Rwanda, delivering a poem he wrote for a national liberation day celebration. In the final scene Ngabo, the poem still ringing in his ears, pauses to consider revenge and forgiveness. Munyurangabo lies somewhere between cinema verité and fable. The actors were recruited from a market in Kigali, and they were both touched by the genocide. The first-time director is a Korean-American who grew up in Arkansas, and he doesn’t speak the language of the locals. The characters are very specific, but they also illustrate a larger point. Ngabo and Sangwa seem like good people, but it is very easy for them to get become part of a group that reaches for ethnic stereotypes. It feels like one of those zero-sum psychology experiments where the best of intentions can be thwarted by a single uncooperative action: you know you shouldn’t reach for the stereotype, but if you don’t, you risk letting the other guy grab it first, and then you spend your life trying to get even. I hate those games and the artificial rules that drive them. We’d all be better off if everybody refused to play. But a clear definition of “winning” and “losing” is tempting for some, and it seems once someone starts, there’s always someone willing pay the damage forward. That’s frustrating, and you will probably be frustrated by some of the characters in Munyurangabo. You will also be relieved that at least one character offers an example of hope when he refuses to play the game.